Last weekend my husband and I had the pleasure of attending the wedding of a girlfriend of mine from work. The wedding was really lovely, and the dinner afterward was just delicious. It was at a nearby winery and renown country smokehouse called The Poacher's Pantry. I'd heard great things about it, and it totally lived up to my expectations. Prior to the wedding, I created two polishes specifically for my friend. After working out the recipe in a mini bottle, I made her two full size bottles, one of each colour. I put them into cleaned out Nfu Oh bottles (from some Nfu Oh polishes I scored for $2). This first one is what she has named 'Fiona's Wedding'. She wore a classic french polish on her fingers for the wedding, but I noticed that she wore this one on her toes! 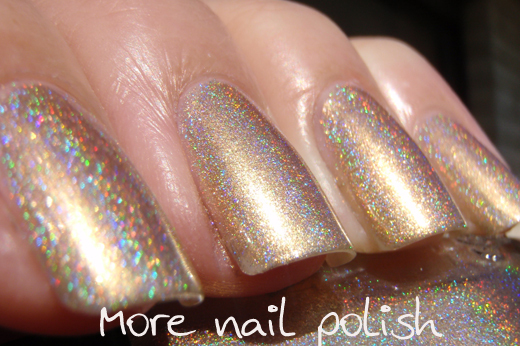 In the sun it's a magical metallic holographic gold. 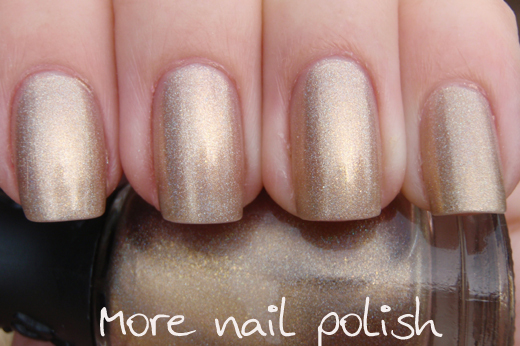 Below in the shade, it is a lovely neutral cool toned gold. I'm so in love with the polish. It's a 100% me colour too, in fact I made myself a full sized bottle of this after I made hers. I made it using TKB forged gold pigment, TKB gold sparks, 1500-35 spectraflair and suspension base. 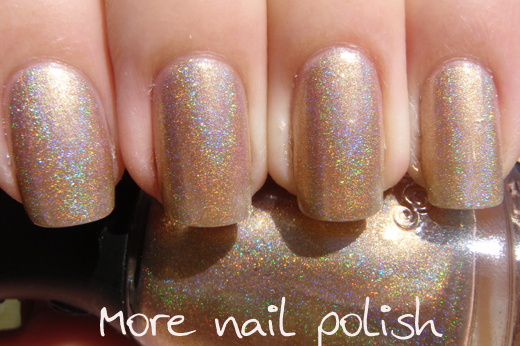 Next up is the second polish, which my friend named 'Fiona's Honeymoon'. Maybe she is wearing this one right now? 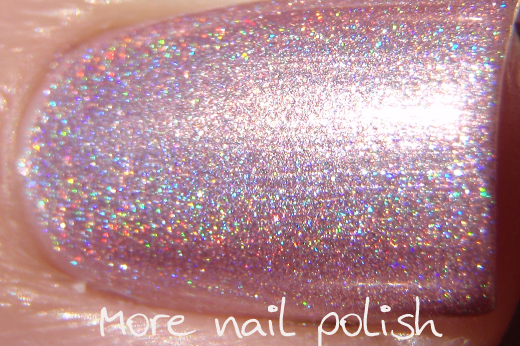 I wanted to create another metallic holo, and I wanted it to be pink. 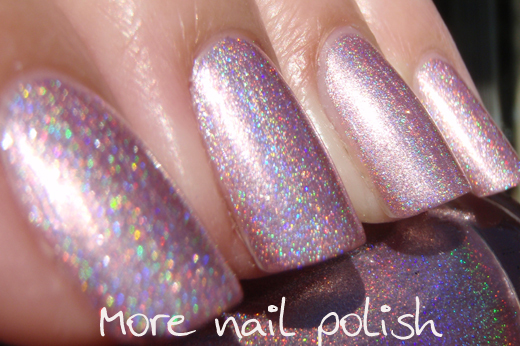 I'd remembered seeing her wear a Sally Hansen pink chrome polish once, so I thought she might like this. Again I mixed a mini bottle first, then made up the full sized one once I had worked out the recipe. I made this one with TKB metallic white pigment (which I never would have bought, but it came in their sample pack where they choose the colours). 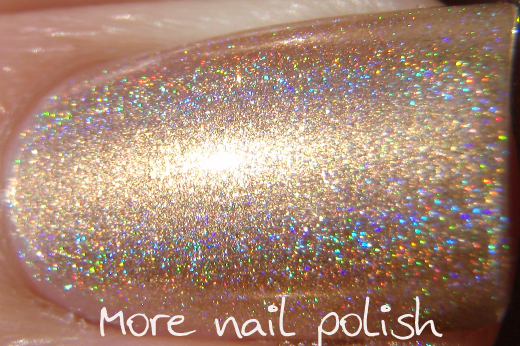 I love the metallic white pigment cause it turns whatever colour polish you are making into a metallic finish, and it also tones down the colour. So it's great if you are going for a pastel shade. I also used some of my magenta liquid tint,1500-35 Spectaflair and suspension base. 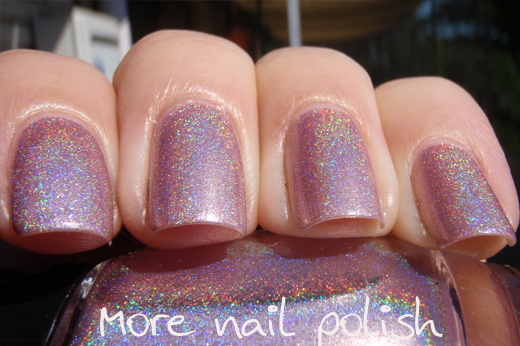 I don't want to call these polishes Frankens, because they were not created from other polishes. They were created from scratch with all raw materials. I think I will just call them custom polishes when I haven't added another polish to it. Oh! That gold! I'm saving this one to make it myself. So pretty! I really like the gold. 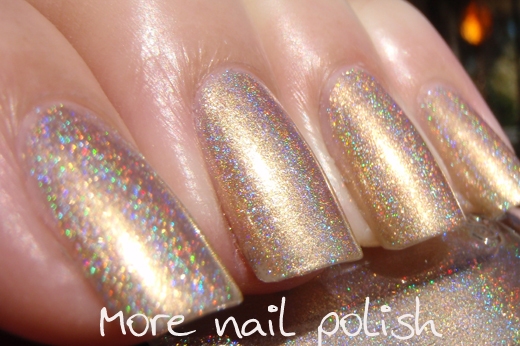 Sometimes gold holos come off garish. Not this one. Bravo! 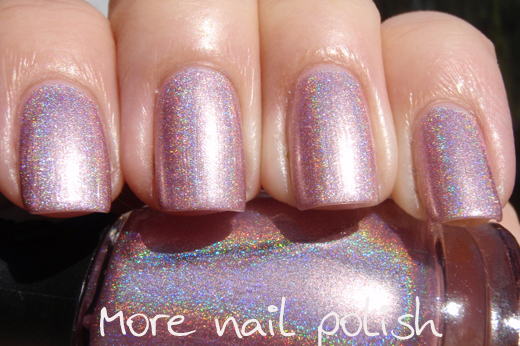 I love the polishes you made! I'm sure the bride enjoyed it too! Now where do we send our orders? LOL Thanks to your generosity with the recipes and resources, I know we can make our own - thank you. I know that you are studying and I am willing to wait LOL. I was wondering how you made your nail polish. 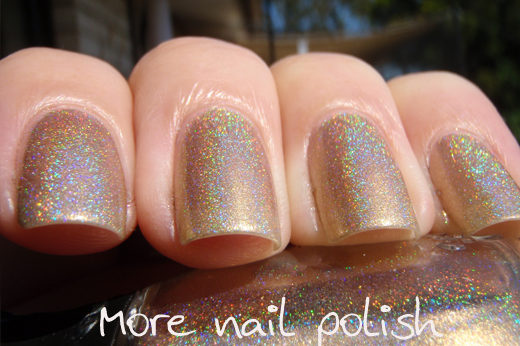 Can you possibly do a tutorial on how you make your pretty holo colors?